Bring your inner magic to life! What we resist persists. Nothing changes without that first step. Let the wisdom and divine guidance of your creative muse take you where the logical mind could never conceive. Let your heart sing for an aliveness, a joy , an exuberance to make life sizzle. Bring your "inner magic” to life to uncover the sense of freedom you always promised yourself you would have. Engage in a daily 15 minute activity pre-determined by our time together to put your life on track. Play today get answers tomorrow for a fun based six weeks. You will see your self-esteem build, distractions fade, positive beliefs strengthen, inner critic screams dim, stories change, and magic truly happens! In Paths to Health! you will experience a more empowered life beyond what the logical mind suggests! Creativity and the power of the mind act as compelling vehicles to take you back to your true essence of healthy being. Develop an acute awareness of how your cells react to creativity and so much more! 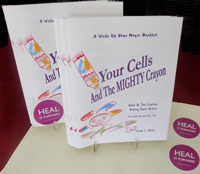 Based on Your Cells and The Mighty Crayon Booklet research, statistics, and practical examples. You will get a free booklet prior to your first mentoring session. Unearth your very own answers and solutions beyond your wildest dreams. 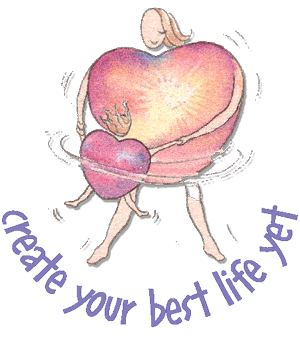 Together we build an action plan to say yes to life - a life that works for you. Each tele-session is 45 minutes. You are special. Take that all important step to Create Your Best Life Yet. Bring your imagination, favorite magic markers and YOU!